Do you find yourself getting attached to outcomes and having difficulty handling the “not now” response? We’ve all been there. When timing fails your outbound process, it can be a challenge to keep focused on forthcoming pipeline opportunities. However, you don’t have to simply submit to the pain of the status quo! 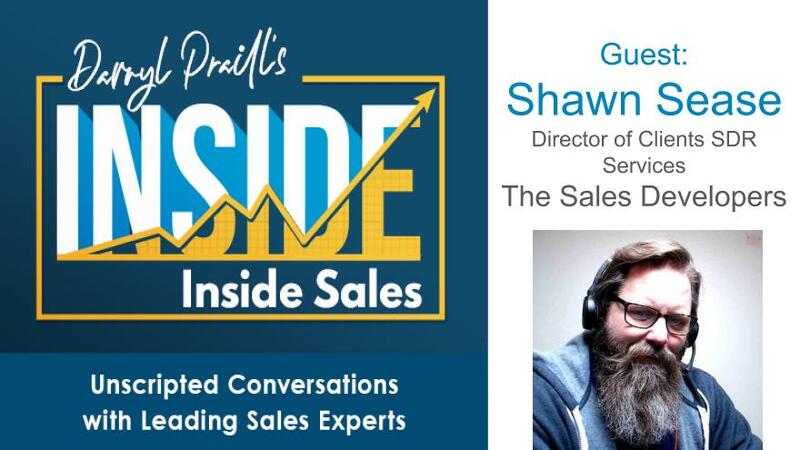 On this episode of INSIDE Inside Sales, we had the invaluable opportunity to gain sage wisdom and insight from Shawn Sease of The Sales Developers. Shawn provides terrific strategies to pivot and turn when the walls of the funnel start to shake. He also provides advice on keeping the long view and pursuing the conversation to get that sale. It’s all here on this on this fantastic episode of INSIDE Inside Sales! Shawn Sease is a Director of Client SDR Services for The Sales Developers. He’s coaching and leading a team of professional conversational SDR’s that supply top of funnel, net new pipeline, for multiple B2B businesses simultaneously, through a reliable commitment to process: Outbound Success = contacting the right target, with the right message, in the right channel, at the right time. Tune in to INSIDE Inside Sales with Darryl Praill for actionable strategies and tactics from top sales experts to increase your sales development success. Darryl has unscripted conversations with the leading sales experts, from veteran sales pros to the newest rising stars. If you’re looking for lively debate, spirited conversations, and proven sales know-how, you’ve come to the right podcast. Funnel Radio is our broadcasting network. Our show is LIVE alternating Thursdays at 9:00am Pacific. Copyright VanillaSoft 2018 All rights reserved.